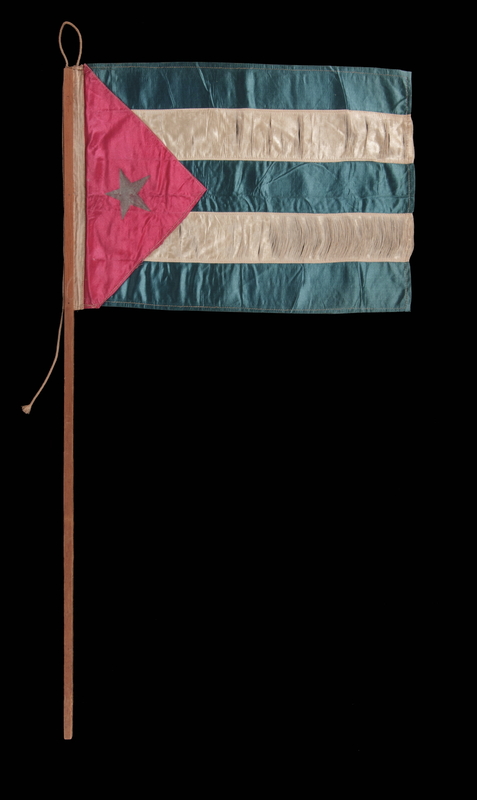 Flag of the nation of Cuba, made in the period between 1890 and perhaps 1915, with pieced-and-sewn construction and retaining its original wooden staff. 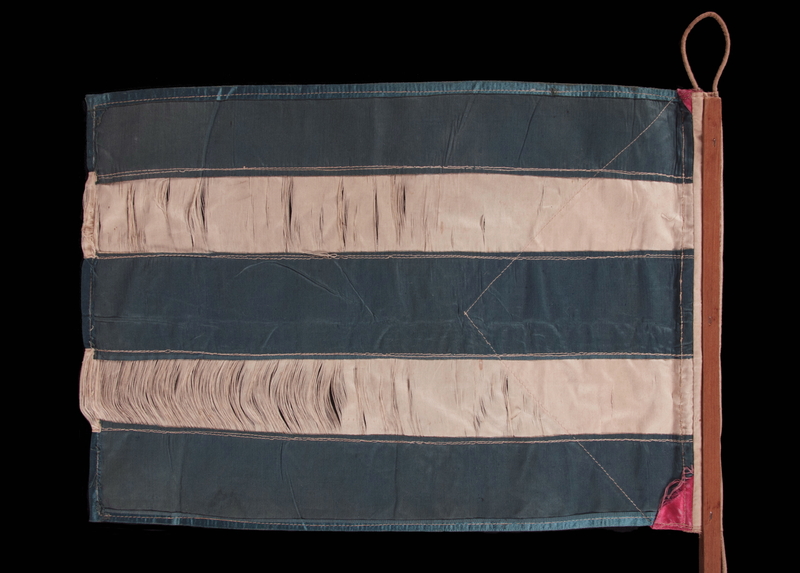 The red, triangular canton and 5 blue and white bars are made of satin silk with a lustrous sheen. The star is hand-painted in silver. A sleeve made of plain weave cotton was added to bind the hoist and through this a braided cotton rope was treaded, looped at the top, and stitched in place. The staff is unusual and especially attractive. 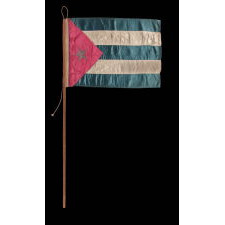 Made of pine and square in shape, unlike its round American counterparts of this period, the center is split on the vertical so that the flag could be inserted and affixed with small finishing nails. This is a one-sided flag, but it was not homemade, as an American flag of this nature would generally be. The flag is made by hand, but this was done in a cottage industry setting and its intended use would have been for a parade or rally. 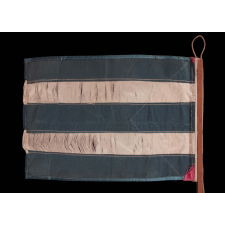 In America, parade flags were seldom made from separate pieces of cloth that were stitched together. They were instead printed on cotton, silk, or sometimes on wool, and had been since the 1840's. 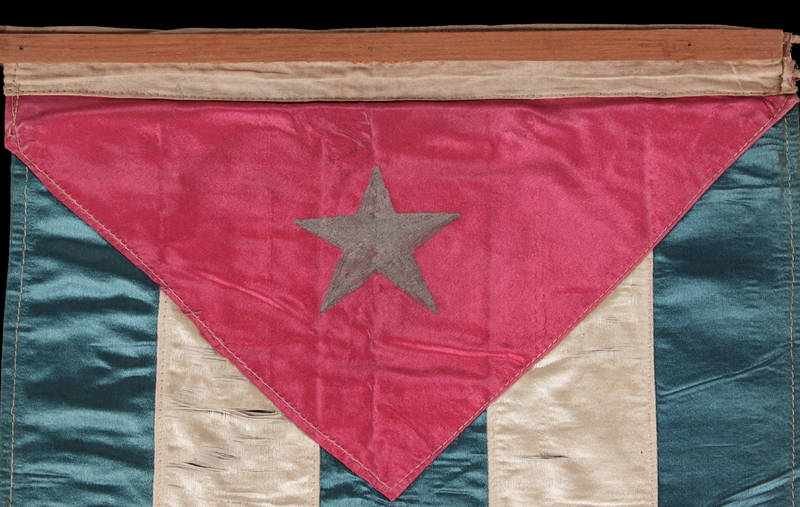 Pieced-and-sewn parade flags are very unusual in the States and the construction is probably indicative of its place of origin, which is unknown. The stitching is all done by machine. The sewing machine was mass-marketed by Singer in America in 1855, and quickly spread elsewhere, and was simultaneously produced and sold by various European countries. By 1900 distribution was so wide spread that even on a small island like Cuba, there were lots of them in use. In December of 1905, the following appeared in The Cuba Review and Bulletin (Vol. 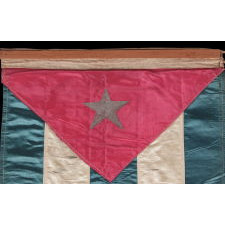 IV, Number 1, Page 9): "If the sewing machine were indicative of the degree of civilization of a country, Cuba would certainly occupy a high place among nations, for the relative number of these machines used and sold annually is very great." 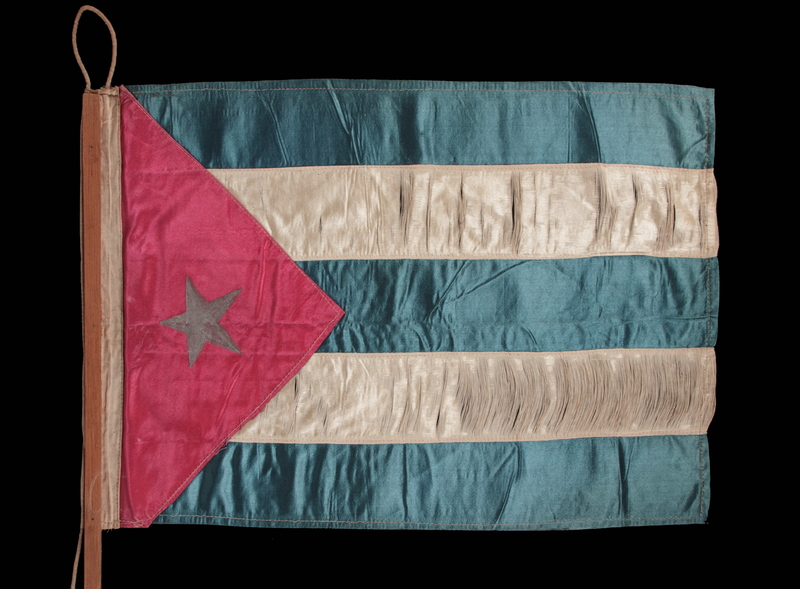 The small size of the flag makes it easily framed and displayed and increases its value to collectors, but the graphics, color and patina are what truly make it wonderful. Note in particular the beautiful shade of Prussian blue, with aqua overtones, and how it contrasts with the ivory white and a scarlet red with a pinkish cast. The star has points of uneven length, one of them small, directed toward the hoist, followed by two medium, then two significantly longer. This adds a degree of folk quality while emphasizing its hand-painted nature. The triangular canton is supposed to be equilateral, but is unusually shallow, with the sides extending onto the striped field being significantly shorter than the one along the hoist. The overall proportions of the textile and its tall, unusual staff, with nicely oxidized patina, and the rope, all contribute to its comely presentation. Even the breakdown of the white silk is endearing, adding visual impact. 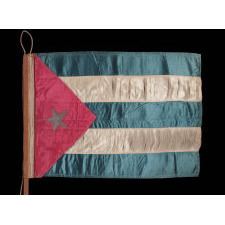 The flag of Cuba was adopted on May 20, 1849 and, unlike the flags of most nations, has remained the same over the course of time. Mounting: The flag has not yet been mounted. We employ professional staff with masters degrees in textile conservation and can attend to all of your mounting and framing needs. Condition: There is extremely minor fading and modest oxidation throughout. The white bars have experienced lots of splitting, but are basically intact, with the fabric retaining its structure on the weft. Many of my clients prefer early flags to show their age and history of use.